Composed by Johann Sebastian Bach (1685-1750). Edited by Carl Czerny. Masterworks; Piano Collection. Kalmus Edition. Form: Fugue. Baroque; Masterwork. Book. 88 pages. Kalmus Classic Edition #00-K03051. Published by Kalmus Classic Edition (AP.K03051). 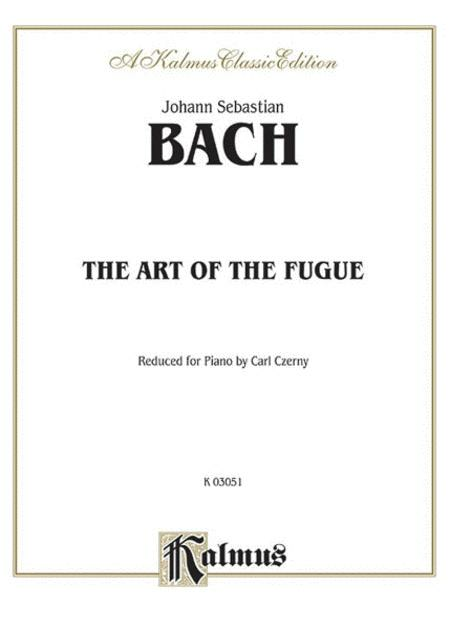 The Art of Fugue, BWV 1080, is an incomplete work by Johann Sebastian Bach. It was most likely started at the beginning of the 1740s, if not earlier. "The governing idea of the work", according to Christoph Wolff, is "an exploration in depth of the contrapuntal possibilities inherent in a single musical subject." 83 pages.